August is known for its smart locks, but the company is partnering with Deliv, a last-mile same-day delivery service, to provide in-home parcel drop-off. August explains that, when you order something from a retailer that uses Deliv, you can opt in for the delivery driver to get a one-time code to drop off your package in your home. You as the customer get a notification when that driver arrives and can watch them deliver in real-time or after the fact. 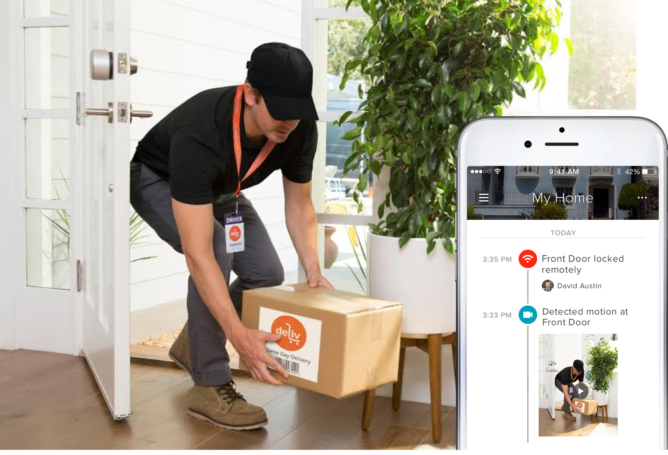 Today August Home and Deliv, a leader in same day delivery services, announced a partnership for in-home delivery to offer consumers greater convenience by placing packages and groceries securely inside their homes, garages and multifamily buildings nationwide. Together, August’s open platform along with Deliv’s last mile fulfillment solutions, gives retailers new options for offering customers safe, secure and convenient, in-home delivery. If you or your company are in the market for a ruggedized Android device, Handheld has you covered. 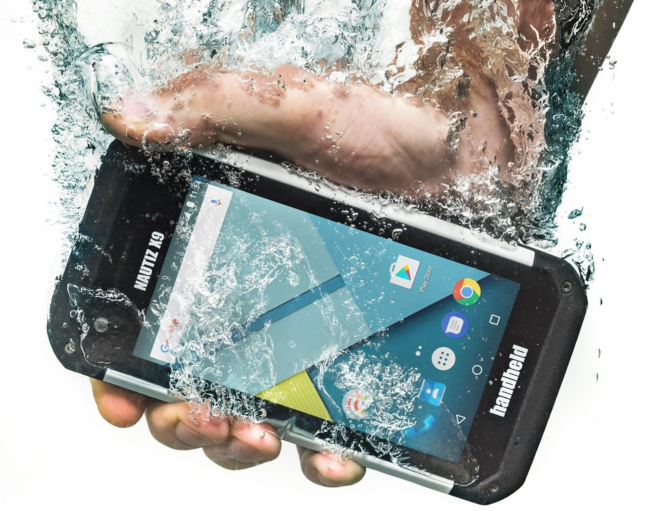 The Nautiz X9 is the latest handset from the manufacturer, using an unnamed 1.3GHz quad-core CPU, 16GB of storage, 2GB of RAM, 5" display, IP67 and MIL-STD 810G ratings, and a 4,800mAh battery. It runs 7.0 Nougat out of the box. The Nautiz X9 is available to purchase right now. JVC showed off two new products at CES: a quantum dot TV and portable soundbar, both with built-in Chromecast. The TV itself "goes beyond" 4K UHD with HDR and quantum dot, and should boast a more realistic color spectrum. The soundbars range from 16" to 37", depending on your needs. Pricing and availability were not specified. IRVINE, Calif., Jan. 09, 2018 (GLOBE NEWSWIRE) -- JVC—the longstanding technology innovator known for its vast line-up of premium products—is set to showcase its newest smart home entertainment products at CES 2018 in Las Vegas from January 9-12, 2018. JVC’s newest products including its Quantum Dot HDR TV and Portable Sound Bar with Smart Dock—works beautifully with the burgeoning Google Home eco-system, allowing users to utilize voice command to manage the Chromecast built-in Quantum Dot TVs and sound bars. With more than 70 percent of smart home automation being compatible with Google Home assistant, you can access and control everything using the Google Home app for Android and iOS via your phone or a device like the best-selling Google Home speakers. Boasting a wider, more true-to-life color palette, JVC’s Quantum Dot TV provides premium technology. Beyond 4K UHD, the Quantum Dot TV with HDR offers stunning picture quality by enhancing the contrast and color representation of the existing pixels. With 4K UHD HDR Quantum Dot TV you’ll see that each R,G and B sub-pixel can generate 1,024 separate color shades resulting in a total of 1.07 billion possible distinct colors. That nets out to stunning life-like picture quality. A Portable Sound Bar with Smart Dock is a versatile audio solution that is both a sound bar and a portable speaker. JVC’s portable sound bar delivers powerful audio in a small footprint. As a sound bar it will compliment and take the TV audio to a next level. As a speaker you can easily stream your favorite playlist and podcast from any room in your house. A family of Chromecast built-in sound bars ranging from 16” to 37” will enhance your home entertainment experience with or without a TV. Kneron wants even people who use "budget and mid-range" phones to be able to use face unlock on their devices. The company has announced a solution that simply requires a front camera. The software uses deep learning to be able to recognize whether the face is real (supposedly in 0.02 seconds), greatly reducing the likelihood of spoofing it with a picture or video. Kneron's solution includes three versions: optical sensing analysis, biological behavior recognition, and background depth detection. OSA determines whether the face is three-dimensional by analyzing light distribution, BBR looks for things like blinking, eye movement, or other quirks in the human face, and BDD prevents the system from being unlocked by a 2D image. TAIPEI, Taiwan, Jan. 10, 2018 /PRNewswire/ -- Kneron, a leading provider of edge Artificial Intelligence (AI) solutions, today launched its Real Facial Recognition solutions to unlock entry level and mid-range smartphones. As long as a smartphone has a front camera, through Kneron's facial recognition software with deep learning technology, it can not only accurately recognize people's facial features, but also determine whether the face is real or not. It can rule out the risk of using photos and videos to unlock a smartphone within 0.2 seconds, with less than 0.0001 error rate. Additionally, one device can recognize several faces. Kneron's Real Facial Recognition solutions have been adopted by smartphone manufacturers and will be marketed worldwide through its partner GMobi. "There are still many security flaws in traditional facial recognition technologies. For example, the smartphones can be unlocked by using photos and videos. In general, to eliminate the risks, other hardware components, such as infrared lenses and high-resolution lenses, must be embedded into the smartphones, and sometimes design changes are required," said Albert Liu, Kneron's CEO. "Kneron now provides innovative real facial recognition solutions to unlock entry level and mid-range smartphones. Only through the software update with no need to change hardware design or add other components, users can experience real-life facial recognition with high accuracy and high security." "GMobi has professional experience in mobile Internet services for many years. We offer a wide range of advanced services to help customers to update their mobile devices and serve around 250 million end-users worldwide," said Paul Wu, GMobi's CEO. "Kneron's innovative Real Facial Recognition solutions allow AI technology be quickly embedded into smartphones and accelerate the popularity of face unlocking applications. We look forward to working with Kneron to promote the solutions to the global market and popularizing the face unlocking function to make it a feature that everyone can use." Kneron Real Facial Recognition solutions integrate sophisticated facial recognition and deep learning technologies, which can recognize a real face within 0.2 seconds, with less than 0.0001 error rate. Additionally, one device can recognize several faces. Kneron Real Facial Recognition solutions include three technical versions: optical sensing analysis, biological behavior recognition, and background depth detection. Optical sensing analysis can determine whether a face is three-dimensional through analyzing the lighting variations on the face; biological behavior recognition integrates behavioral detection, such as eye blinking, to determine whether a face is real; the background depth detection solution can be used if there is an autofocus function in smartphone's front camera. It can analyze the scene depth of field to avoid unlocking by a two-dimensional image. Linksys is now offering a dual-band option for its Velop mesh network system. It's not super exciting stuff, but Linksys is excited about the software improvements. You can expect to see these this spring, with the app and firmware updates slated for whenever they're available. PLAYA VISTA, Calif. and LAS VEGAS, Jan. 8, 2018 /PRNewswire/ -- Linksys®, celebrating thirty years of networking and Wi-Fi innovation for the home and business this year, today announced at the Consumer Electronics Show in Las Vegas that it is expanding its Velop™, whole home mesh Wi-Fi line to include a Dual-Band offering and new software advancements that enhance performance with Intelligent Mesh™ technology, security features with advanced parental controls, network traffic monitoring, and web site blocking as well as ease of use with improvements in the Linksys app. Velop is now the most flexible whole home mesh Wi-Fi system on the market. It can be installed in different configurations to support any type of home, is compatible with any ISP modem or gateway, and both Dual-Band and Tri-Band nodes are 100% interoperable and interchangeable. Linksys will be showcasing its Velop product line at CES this week in the South Hall 3 – Booth #30750. Linksys is expanding its Velop product line to include a Dual-Band modular Wi-Fi system, the world's first mass-market Flexible Wi-Fi System, (available in 1-pack, 2-pack and 3-pack options) that can be installed in various mesh configurations providing fast and reliable Wi-Fi to the edge of a home network. Velop Dual-Band nodes are designed for performance as well as elegance; they stand about two inches shorter than the Velop Tri-Band solution and small enough to be placed anywhere with a clean and attractive look that appeals to everyone - which is unique to the mesh category of solutions for the home. Each Velop "node" is a powerful Dual-Band AC1300 device that serves as router, range extender, access point, and bridge which provides users the future proof technology they need as they bring new and more devices into the home. Each node is configured during setup by the accompanying Linksys app (available for iOS and Android), which provides the industry's simplest and most intuitive setup leveraging Bluetooth to securely communicate between the mobile device and each node. After setup is complete, the Linksys app serves as a powerful Wi-Fi management tool with useful features, such as guest access, parental controls, device prioritization, and insights that help Velop users get maximum performance and utility from their network. Velop helps users get the most out of their broadband subscription by delivering 100% of their speed to the edge of their network. "According Industry Reach Group, NPD - Mesh Wi-Fi systems grew 338% in 2017 and will continue to grow in 2018; so we wanted to make sure that consumers had price and performance options to choose from", said Justin Doucette, senior director of product management at Linksys. "Our new Velop Dual-Band provides the price for performance that customers are looking for plus all the intelligent software and security features that continue to be updated for real time access to the latest enhancements." True Modular Mesh Design – Each node is built to connect with each other over Wi-Fi or wired Ethernet or combination of the two for best performance. They auto configure to connect in multiple different mesh topologies. Intelligent Mesh™ Technology – The Velop system adapts to a user's Wi-Fi needs. It self-heals and optimizes to consistently deliver fast, flawless Wi-Fi everywhere in home. Velop Dual-Band and Tri-Band are interoperable – Velop is the most flexible Wi-Fi system which users can simply select a Velop system based on size of their home, internet connection or smart home readiness. Velop users can use both the Tri-Band and Dual-Band versions on the same network. Adding a Dual-Band node to an existing Tri-Band mesh network is an affordable way to extend coverage. Introducing a Tri-Band node to a Dual-Band mesh network will unlock future-proofed smart home capabilities and improve performance. App-Led Setup – The new Linksys app automatically identifies the nodes to be setup using Bluetooth and creates a secure connection between the mobile device and each node. The app guides users through the installation process using visual animations where needed to clearly explain each step, including the transition from current networking hardware. Patented-Pending Spot Finder Technology – The placement of each node is critical to establish a reliable connection. During setup, Velop will recommend the best placement to reduce latency, maximize throughput and improve range and signal strength. One Network: The Velop system uses one network name, one password, one admin password for a consistent and secure mesh network of multiple nodes. Velop's guest network will extend to all nodes and changing passwords to stay secure only requires a single update in the Linksys app or web interface. 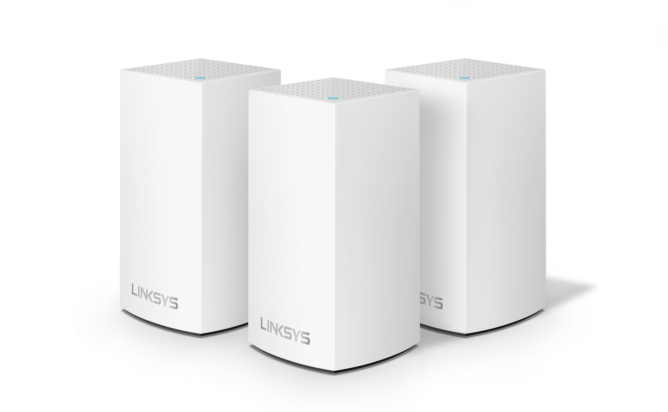 The Linksys Velop Dual-Band Whole Home Mesh Wi-Fi System (available in 1-pack, 2-pack and 3-pack) is planned to be available this spring. Prices will be announced when product is available at major retail and online stores. Bixby Vision will be able to identify your food and give you the calorie count. Not available to the public yet, Samsung says that Bixby will use generic information to identify the food (so it cannot account for variation in recipes). The company is also hoping to fold this information into S Health to give users a better understanding of what they're eating and how they're burning calories. Scosche announced several new products at CES. The Rhythm 24 is a successor to the Rhythm+ armband heart rate monitor. The 24 keeps the waterproof durability while improving on the design and featureset. The BoomBottle MM is Scosche's new cylindrical speaker with magnetic mounting and indoor/outdoor EQ sensing adjustments. Other things like a Qi mat were also announced. Swann launched a new smart doorbell, with a rechargeable battery, HD video, intelligent detection, push notifications, and an optional chime unit. This is planned for release this spring. Swann also announced that its products will work with Assistant and Alexa, such as voice commands via the Home or Alexa and showing feeds on Chromecasts/Android TVs. To shorten a PR that was much longer than it needed to be, Tile announced new partnerships with companies like Bose, Comcast, Samsonite, and others to provide Tile's location services to those products. Bose will receive Tile support this spring for its SoundSport Wireless and QC30 devices. Samsonite is a pretty obvious one, with luggage that will come with Tile, also scheduled for this spring. Propeller smart inhalers will also be getting Tile, Comcast will use the service in its smart home ambitions, Ruckus Networks will be able to detect Tile-enabled objects via indoor/outdoor access points, and the San Jose airport will be littered with Tile sensors to help find lost items in real-time. SAN MATEO, Calif., Jan. 08, 2018 (GLOBE NEWSWIRE) -- Tile, the world’s leading smart location company, today announced expansions to the Tile Platform with several new partnerships, delivering on its vision to build a world where everyone can find everything that matters. Today there are multiple innovative ways in which brands can partner with the Tile Platform to give their customers the protection and peace of mind that Tile offers. Through these innovative new partnerships, Tile continues to enable other companies to embed Tile’s easy-to-use solution directly within their products. The company today announced it is working with leading consumer electronics company, Bose. Beginning late spring 2018, Bose SoundSportⓇ Wireless and QuietControl™ 30 headphones will come with Tile technology embedded inside, allowing users to ring their headphones when misplaced or tap into the Tile community when truly lost. Tile also welcomes Samsonite to the Platform. With a global pilot scheduled for spring 2018, Tile and Samsonite are working together to define and create next-generation luggage. Propeller Health is now working with Tile to integrate Tile technology into its sensors. Through Propeller's connected inhalers, digital interfaces and personalized insights, it will now be easier than ever to ensure asthma and Chronic Obstructive Pulmonary Disease patients are able to find important inhalers and information. In addition to growing the global Tile community, Tile is expanding its technology ecosystem through access point partnerships. By creating additional access points to receive location information, Tile increases the likelihood of finding lost items while reducing the time required to do so. Tile and global media and technology leader, Comcast, are teaming up to minimize loss and explore ways to improve the smart home experience. Ruckus Networks, a leader in secure access networks, has partnered with Tile to detect Tile-enabled items from indoor and outdoor access points. San Jose International Airport, the fastest growing airport in the United States, has also joined the Tile Platform. Tile is blanketing the San Jose International Airport with Tile access points to help find lost items throughout the airport in near real-time. Additional Platform partners include Herschel Supply, Boosted Boards, Bianca and Starling by VersaMe. Visit TilePlatform.com to learn more. uSens talked about its new uSensAR platform that brings AR to lower-end, single camera hardware. Using computer vision, machine learning, and the smartphone hardware, uSensAR supposedly offers high-end AR experiences without the need for an expensive device. It's resilient to poor camera, IMU, and sensor data. The SDK will be available by mid-2018. LAS VEGAS and SAN JOSE, Calif., Jan. 8, 2018 /PRNewswire/ -- CES 2018 -- uSens, Inc., a pioneer in HCI and computer vision tracking solutions for augmented and virtual reality (AR/VR), today announced the availability of uSensAR, a smartphone augmented reality (AR) engine. uSensAR is a single camera, smartphone AR engine that is optimized for low-end cameras, sensors and IMUs. 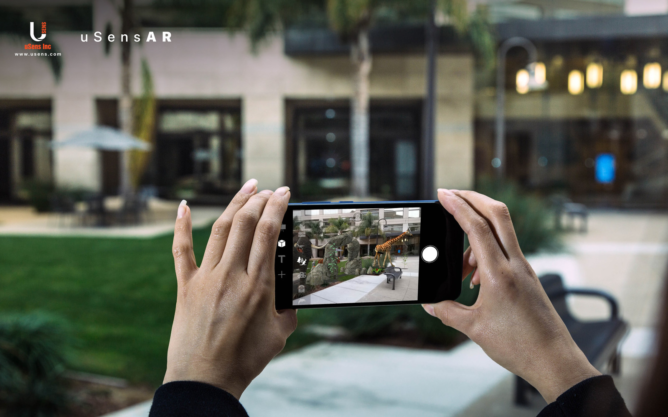 It utilizes computer vision, machine learning, SLAM and smartphone hardware to bring high-performance AR experiences to all Android smartphone users, not just those with expensive, top-tier hardware. As part of this announcement, uSens has partnered with Spreadtrum Communications (Spreadtrum), a leading SOC company. uSensAR has enabled AR camera effects for the native camera app for the Spreadtrum SC9853 chipset platform, which is expected to sell hundreds of millions of smartphones in 2018, bringing AR experiences to those users for the first time. "ARcore currently only serves about 30 million Android phones, which is just five percent of the entire Android smartphone ecosystem," said Dr. Yue Fei, uSens CTO and co-founder. "For the AR industry to thrive, it is essential that as many people as possible have access to AR-ready devices, which in turn will entice more AR content to be developed. With the release of uSensAR, we are allowing developers, smartphone manufacturers, and content creators to build those AR experiences not just for iPhone, Pixel and Samsung S8 users – which ARkit and ARcore have limited their offering to initially – but for the entire Android ecosystem." Unlike other AR engines and frameworks, uSensAR is optimized for mid- and low-tier phones, with even better performance on high-end smartphone models. It is extremely resilient to poor camera, IMU and sensor data, while remaining flexible to integrate with all Android smartphones. Powered by SLAM technology, a series of computations and algorithms that constructs a virtual map of an environment, this markerless approach tracks a user's location by continuously scanning and 'learning' about their environment via computer vision. A user's position can then be tracked in unknown and changing environments, which enables 'World Scale' tracking, for a truly mobile experience. Spreadtrum is a leading fabless semiconductor company in China with advanced technology in 3G and 4G wireless communication standards. With 14nm 8-core 64-bit Intel Airmont processor architecture, Spreadtrum SC9853 reaches 1.8 GHz in dominant frequency, and possesses efficient mobile computing performance and ultra-low power dissipation management. "2018 is the year where we really expect to see augmented reality show its true capabilities, and we are seeing increased demand for AR-ready phones among our customer base accordingly," said Adam Zeng, Global Executive Vice President of Tsinghua Unigroup and CEO of Spreadtrum. "Spreadtrum has been committed to providing differentiated and diversified product portfolios for consumers all over the globe. We are excited to publish this mobile AR solution together with uSens, which is another excellent example of our premium solution integrating leading technologies and optimal benefits."